It’s one of my favorite times of the year again: The Chipstone Foundation’s Object Lab 3.0 just took place last week. As always, we were incredibly impressed with the depth and creativity emanating from the participating students. For those of you that haven’t heard about Object Lab, it is a student workshop focused on intense object study. Nine college juniors and seniors from all over the country are selected to participate. They spend four days in Milwaukee, alternating between the Milwaukee Art Museum, the Chipstone Foundation house in Fox Point and going on various field trips around the city. The Object Lab has been in existence for three years. 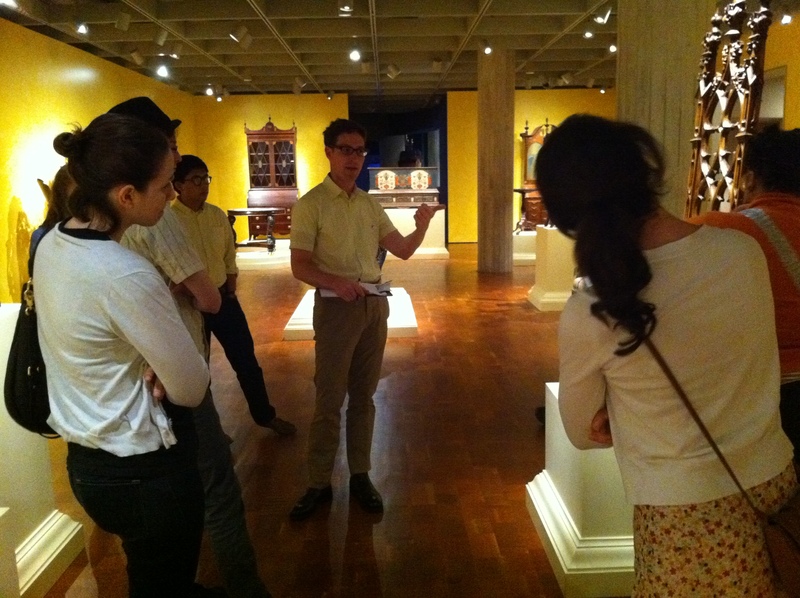 Each year has a different focus, but is always centered around handling museum objects, something that even college students interested in the decorative arts might never have been allowed to do before. As you know from my previous blog posts, Chipstone believes that in order to really get to know an object and be able to come up with various interpretations, it is necessary to be able to handle it. This year’s Object Lab theme was production. Although the schedule is a mystery to the students (they don’t find out what the next activity will be until they’re about to do it), since the workshops are different every year, I can divulge this year’s object extravaganza to you in this post. On Sunday morning, students flew in from different schools around the country, including UW- Madison, Yale, Clark, Rice, University of Illinois at Urbana-Champaigne, Skidmore, and the School of the Art Institute of Chicago, and met at the Milwaukee Art Museum. We toured the Lower Level decorative arts galleries, emphasizing diverse methods of object interpretation, design, and museum labeling. Fo Wilson, University of Wisconsin-Milwaukee professor and curator of The New Materiality: Digital Dialogues at the Boundaries of Contemporary Craft, met us in front of her exhibition. She explained the how technology, and the information provided by technology, is being used as a new material by the artists of the exhibition. We ended the evening discussing museum practices and exploring alternatives to the traditional museum experiences. On Monday, we met bright and early at the Chipstone Foundation house in Fox Point. After a short tour of the collection, the students were divided into three groups of three and handed a ceramic object per group. The groups then had 20 minutes to interpret the object visually and write a museum label, trying to figure out what the object was and what it might have been used for. The objects ranged from a face jug to a chamber pot. It was interesting to listen to their interpretations and observe the creative ways in which they handled not having any research or information given to them about their objects. One group posed questions in their label, with the purpose of getting around their lack of information and at the same time engaging their audience by making them an active participant in the process. From this exercise we moved on to what has proven to be one of the favorite activities at Object Lab: the blindfold exercise (above). The students were once again divided into groups, but this time two students from every group were blindfolded, while the third sat behind a screen. 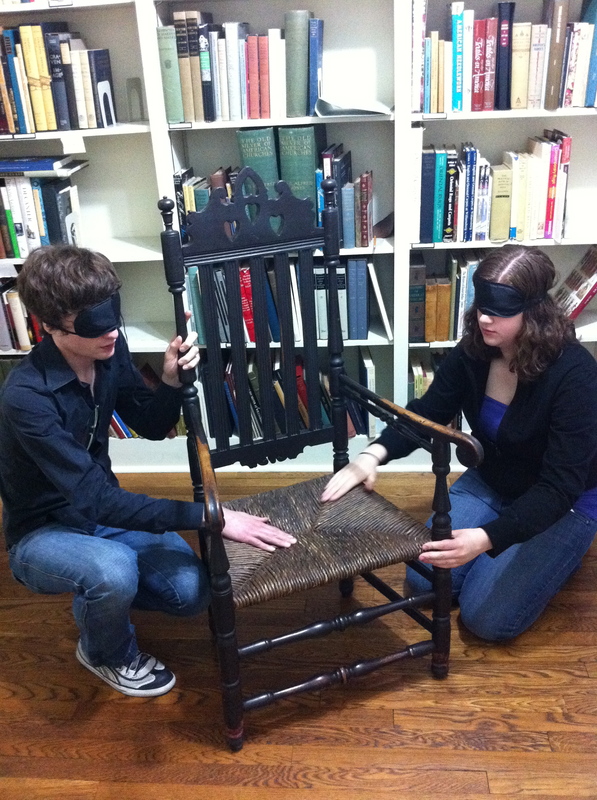 The two blindfolded students were given a piece of furniture to describe using the sense of touch, while the third person sketched, wrote, and ultimately tried to figure out what was being described. They were instructed to create an anthropology label (similar to the ones in Chipstone’s Hidden Dimensions gallery) for the objects, and were not allowed to look at the object until it was time to present. Again, the results were impressive. Everyone who had a turn blindfolded felt compelled to sketch the object the moment that they switched with the person behind the screen. Some of the sketches, created just from information gained by touch, looked exactly as the object did. All three interpretations were engaging, more so than when the students had just used their eyes, but one really stuck out. One group had been assigned a spice chest as their blindfold object. They came up with a label written from the perspective of the spice chest itself. The students gave the chest a creative voice as it spoke of all the secrets hidden within its drawers and all the indiscretions it had witnessed. We moved on from sensorial interpretations to actual making. Randy O’Donnell (who is featured in our woodworking videos in the Chipstone video gallery) taught us how to use different tools and 18th century techniques at the Lynden Sculpture Garden. 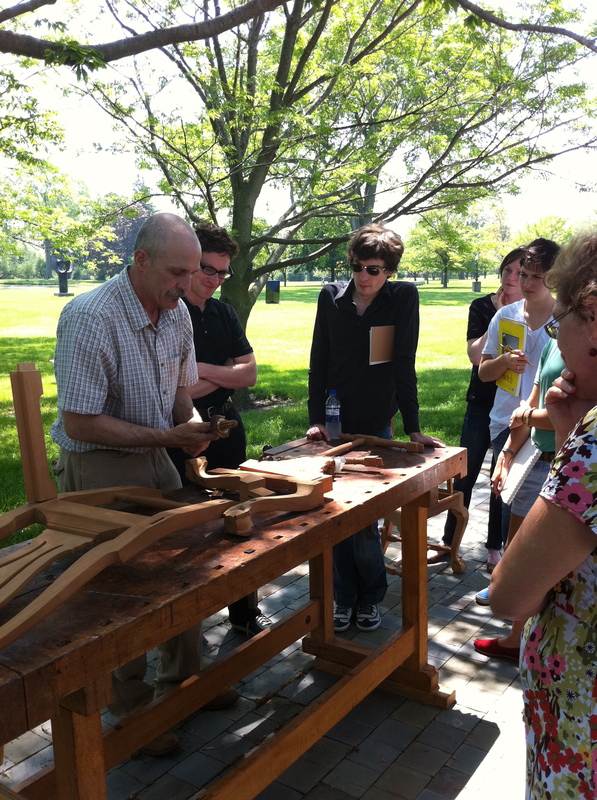 Many of the students had never worked wood before, and gained a deeper appreciation for the furniture they study. On Tuesday, a field trip to the Kohler factory in Kohler, WI, took us from the hand-made to the factory-made. Beth Lipman, whose work is on view at the Milwaukee Art Museum in Gallery 31 on the Main Level, gave a tour of the ceramics factory, as well as the Arts and Industry program. We were all impressed at the amount of skill and material knowledge that goes into factory production, and were able to compare and contrast this experience with that of watching Randy work. On Wednesday morning we met artist Sal Randolph at the Milwaukee Art Museum. Sal then led us through the mysterious Order of the Third Bird exercise, an intense close-looking experience centered, in our case, on Haim Steinbach’s pink accent. Although an explanation of the exercise does not do it justice, I encourage you all to attempt to look at a piece of art for 21 minutes and see how your art experience changes. After a brief, but compelling historiography seminar by Yale professor Ned Cook, it was time for the students to create their final project. Each group was given an object and a word. Their challenge was to interpret the object through the word and create a video label from this interpretation. They worked with Tanya Aguñiga’s Rock Sofa (word: island), de Seller’s Emergency Chair (word: contingency) and Bike Furniture Design’s Chair (word: inertia). You can find them on Chipstone’s ArtBabble channel. They were a great end to a productive four days as they tied in all the different interpretation strategies in a creative way. Now, I can start counting the days until next year’s Object Lab. Maybe one of you will be inspired to participate! This entry was posted in Art, Curatorial, Exhibitions and tagged Chipstone Foundation, Decorative Arts, Object Lab. Bookmark the permalink.